Huading multi-plate screw press are specially designed for dewatering of sludge from water and wastewater treatment, biogas residue and industrial slurries. They are characterized by moderate speed, minimal supervision plus low power, noise and vibration levels. High uptime, easy maintenance and cleaning during operation are other benefits. Huading multi-plate screw press is more advanced than traditional dewatering systems which can be easily blocked by low concentrated sludge. 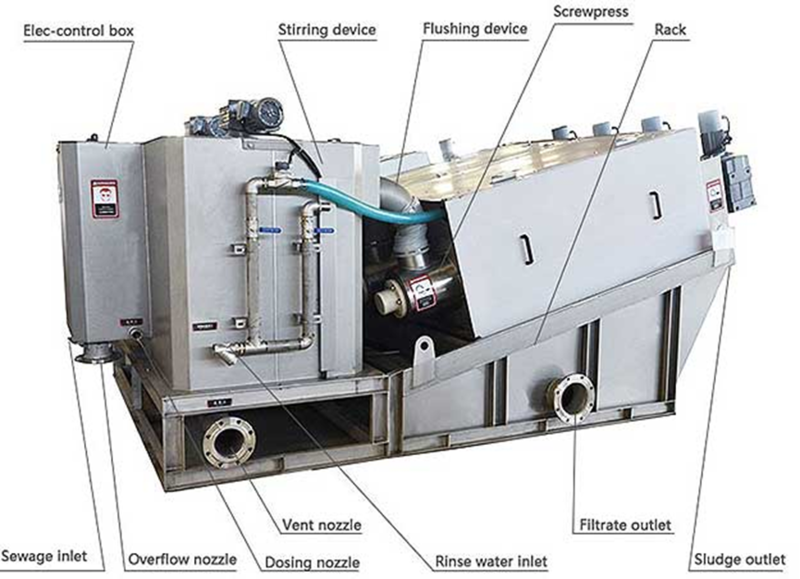 The screw press allows for automatic continuous sludge flocculation, thickening, dewatering and filtrate discharging. The thickening zone allows the system to process both highly concentrated sludge as well as sludge with a high-water content. Dewatering takes place in an inclined drum with a wedge wire screen forming the cylinder wall, and an internal screw conveyor. Polymer is dosed and mixed in the dedicated polymer mixing container. The flocculated sludge suspension is then led into the screw press’ inlet and to the first drum section for drainage of free water. Gradually, the sludge suspension increases in dry solids content as it enters into the pressure zone of the drum. By virtue of the counter-pressure created by a restricted outlet, more free water is released from the sludge cake as it progresses towards the outlet. The released water is drained off to the filtrate outlet under the feed inlet. 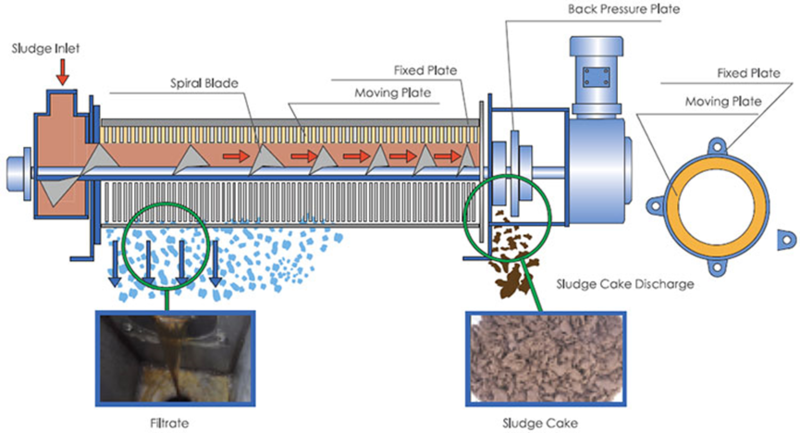 The filtered sludge cakes are pushed forward by the shaft and finally discharged from the end.